By Matthew Minor, M.D. and William T. O’Brien, Sr., D.O. 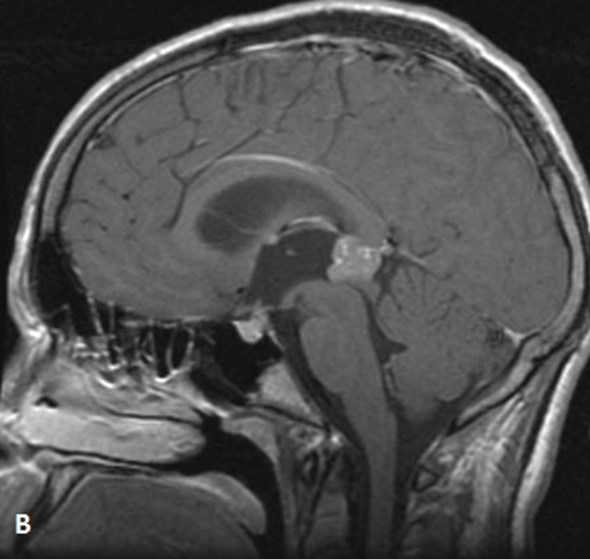 A 15-year-old boy presented with acute exacerbation of chronic headache, as well as new onset nausea, vomiting, and visual changes. Past medical history and review of systems were noncontributory. Physical examination revealed mild papilledema and paralysis of upward gaze. 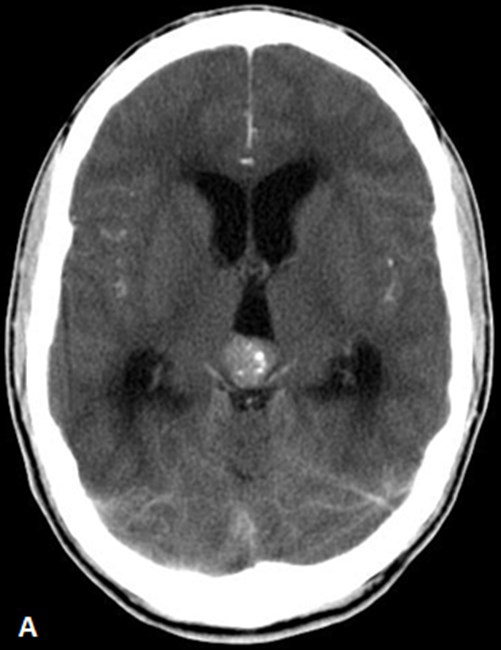 The patient was subsequently referred for an emergent head CT, which was initially performed without contrast but then with contrast based upon the preliminary findings, followed by an MRI of the brain with and without contrast (Figure 1). Pineal region masses include those that originate from the pineal gland, as well as those that arise from adjacent structures. Masses of the pineal region range from simple, benign cysts to high-grade neoplasms. Imaging plays an important role in establishing the appropriate diagnosis or a reasonable list of differential considerations, as well as for identifying underlying complications. Tumors originating from the pineal gland represent 3-8% of all pediatric intracranial neoplasms and 0.4­1.0% of all adult intracranial neoplasms.1 Germ cell tumors are most common, particularly germinoma, followed by pineal cell tumors, to include pineocytomas and pineoblastomas. Pineal cysts are very common and have an outer wall composed of 3 layers: inner gliotic tissue, middle pineal parenchymal tissue, and outer connective tissue. Pineal gland cysts are usually asymptomatic and range in size from 2-15 mm. If the cyst reaches 15 mm or larger, however, it may become symptomatic secondary to compression of the tectum. The vast majority of cysts are simple, unilocular, and follow CSF density (CT) and signal intensity (MRI), although the cyst may not completely suppress on FLAIR sequences secondary to proteinaceous content. Peripheral enhancement may be seen but is usually incomplete.4 Complex cysts may be multilocular with variable signal intensity but do not have solid enhancing components. Atypical cysts are followed on imaging and clinically to ensure stability and benignity. Germinomas are the most common intracranial germ cell tumor (GCT) and represent 1-2% of all intracranial neoplasms.1 They represent the most common pineal malignancy. On CT, germinomas are typically hyperdense due to high cellularity and tend to engulf pineal calcifications centrally within the mass. On MRI, germinomas are typically iso-to hyperintense to gray matter on T1 and T2 sequences and demonstrate avid, homogenous enhancement. They may also have cystic components. Germinomas are prone to dissemination throughout the cerebrospinal fluid (CSF);therefore, imaging of the remainder of the neuroaxis should be performed. Pathologically, germinomas are very cellular tumors and highly responsive to radiation therapy. In the presence of a germinoma, hCG will often be elevated within the CSF.3 Teratomas are less common GCTs composed of elements from all three germ layers and typically have cystic and solid components with macroscopic fat. A variety of pathological entities may involve the pineal region, ranging from benign cysts to malignant neoplasms. Patients may be asymptomatic or present with symptoms most often related to compression of adjacent structures. Cross-sectional imaging, especially MRI, is essential in the work-up and management of pineal region masses. Simple, uncomplicated pineal cysts are benign and do not need further imaging. When presented with an enhancing mass originating from the pineal gland, on the other hand, it is important to image the entire neuroaxis, as aggressive lesions in this region are prone to CSF dissemination. Smith AB, Rushing E, Smirniotopoulos JG. Lesions of the pineal region: radiologic-pathologic correlation. RadioGraphics 2010; 30(7): 2001-2020. Poppen JL, Marino R. Pinealomas and tumors of posterior portion of third ventricle.J. Neurosurg. 1968; 28: 357-364. Tien RD, Barkovich AJ, Edwards MSB. MR Imaging of pineal tumors.AJR Am J Roentgenol 1990; 155: 143-151. Smirniotopoulos JG, Rushing EJ, Hernando M. Pineal region masses: differential diagnosis. RadioGraphics 1992; 12(3): 577 -596. Bognar L, Turjman F, Villanyi E, et al. Tectal plate gliomas part II: CT scans and MR imaging of tectal gliomas. Acta Neurochil (Wien) 1994; 127: 48-54. Pineal Region Mass. J Am Osteopath Coll Radiol.